Ah. 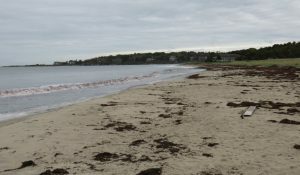 Last Friday was our Floating Day Off, and we went to the ocean to observe the storm tide. Once that was accomplished, we of course turned right around and went home to go back to work. 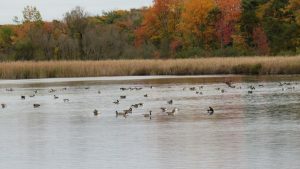 In actual reality, we went to Scarborough Beach State Park, as Steve had seen a sign (by which I mean a road sign, not A Sign), and we used our new-found superpowers as Elders of the State to pass through the gate and walk down the road through the marsh, which was filled to the gills with Canada geese, to the weed-strewn beach. 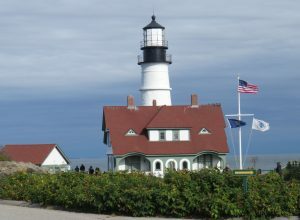 From there, we more or less retraced our path of a couple weeks ago, this time driving back into the upscale housing development around Two Lights (no access to the lighthouses), and then down through Fort Williams Park, ’til we hit the ocean, sort of, and Portland Head Light. 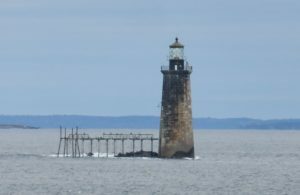 Also visible from Portland Head is Ram Island Ledge Light. There is a third lighthouse visible from this position to those with Really Good Eyes, or Steve’s camera, called Halfway Light. My camera is not long-sighted, so you’re spared a picture of that light. 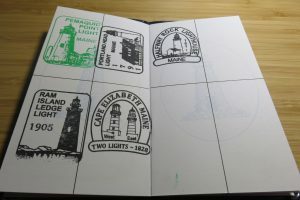 I offer instead my Lighthouse Passport, now with five stamps! The docent at the museum at Portland Head Light, keeper of the stamps, is empowered to bestow stamps for Portland Head Light, Ram Island Ledge, Halfway Light, and Two Lights. So, that’s what we did on our last day off. This week, our Floating Day Off is — today. We will be attending a Community Health Needs Assessment sponsored by one of the local hospitals at mid-afternoon. This is in keeping with our goal of becoming an active part of the new community. So! That’s all I’ve got, except the weather, which has been Quite Windy. We lost two trees down near the Forest Gate, and the gate next to the house (which, to be fair, was not particularly well-tied-down). Which reminds me that, last week, the neighbor’s dog called in some guys to take down the Enormous Pine in their back yard, which had started dropping Large Limbs Too Near the House, and now my office gets the sun much later in the day. I hadn’t realized that the Big Tree had shaded the front right clerestory windows quite so much. Good job that I bought myself a Computer Cap a couple weeks ago. I’m still trying to understand the dynamics of this house — how the heat moves from my large and sunny room to warm the kitchen and dining room — and how the living room fits into it all. Well. I’ll be studying that all winter, I’m guessing. Halfway Light. What a name. It conjures all kinds of ideas about its backstory. I’ll be dreaming of that in my off hours. I hear you about learning the light & heat of a new home – as I move less and less often, I notice it profoundly at a new space. Enjoy your day off; I’ll be juggling some training videos (re-learning Python) around a headache. Windy & chilly in Albuquerque as well. Well, chilly by Albuquerque standards – long sleeve tshirt + vest was certified Warm Enough. About migrating heat – [long story short] we installed an HVAC system called “mini split” which effectively provides thermostat heat per room. Several neighbors & friends have installed small scale mini splits in 1, 2, 3 rooms to augment whole-house systems. If heat/cool migration gets too annoying, take a look.